Artistic decks are not to everyone’s taste. 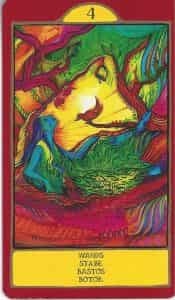 They have symbolism which is harder to recognize, sometimes completely divert from known imagery and if you’re not a 100% intuitive reader it will mean learning another tarot language. 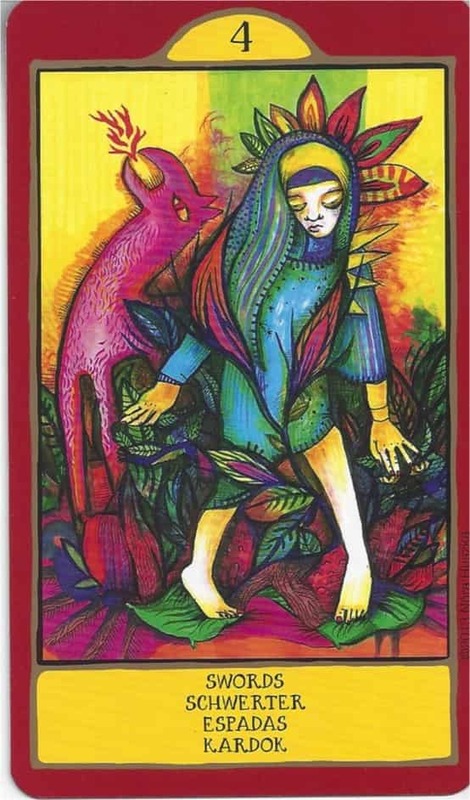 The Gypsy Palace Tarot by Nora Huszka is such a deck. If you had no intention of going on a new intense journey you better stop reading. If you’re still with me: good for you! 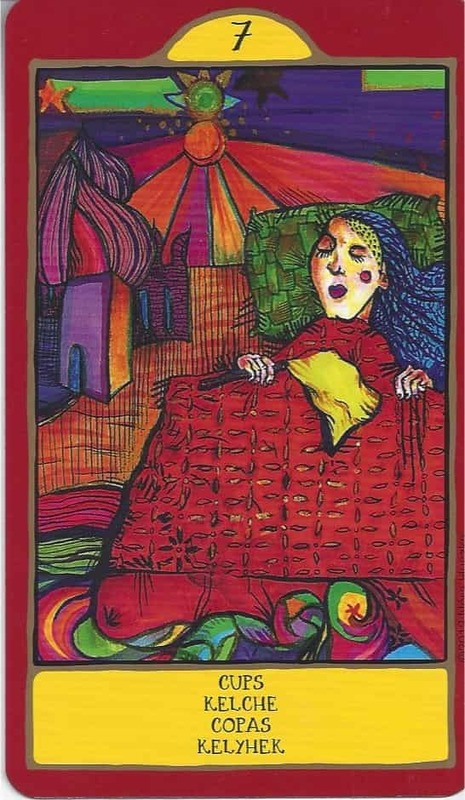 I took some extra time to review The Gypsy Palace Tarot, because it is one of these tarots that has to grow on you. The deck itself phrased it quite distinctly: when asked how I could best work with it, I got The Tower. 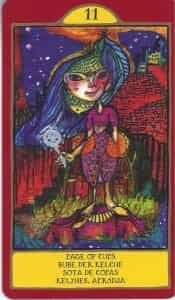 In other words: before you start shuffling The Gypsy Palace Tarot you need to be ready to forget everything you’ve learnt so far and start afresh. This pack of 78 cards is going to take you places. New, possibly scary, vivid, imaginative places. Draw from that intuitive well you have inside of you if you go on this journey. The inside of the handmade LWB for The Gypsy Palace Tarot. I especially like the questions for every card. 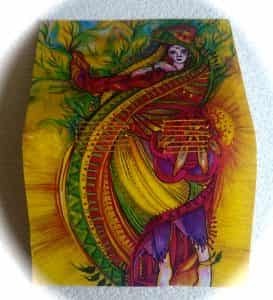 Handmade companion Gypsy Palace Tarot. I was lucky enough to get one of my favorites, The Sun. I think that was exactly what Nora Huszka, the designer of this very artsy, bold and colorful deck wanted when she combined her paintings. 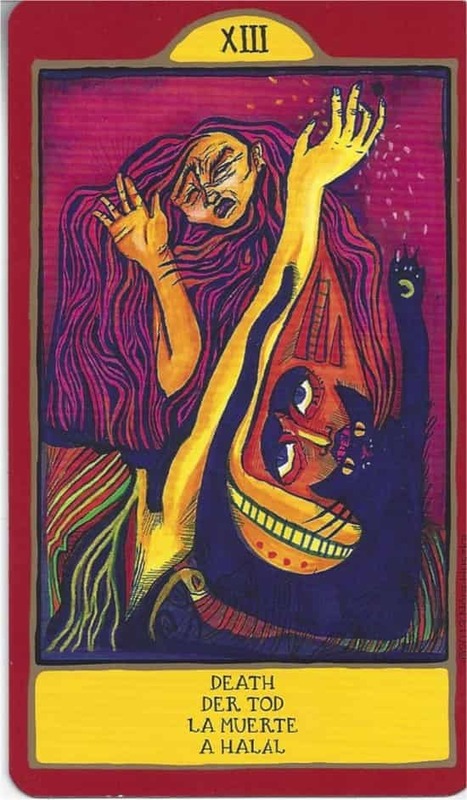 The Gypsy Palace Tarot is no ordinary Tarot. 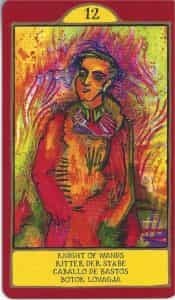 It is not a Waite-Smith, it is not a Tarot de Marseille or a Thoth…it is The Gypsy Palace Tarot in all its colorful glory. First let me tell you a bit about the look & feel. The cards have great card stock – although I did notice some chipping – and come in a red-terracotta colored tuck-box, signed by Nora Huszka on the side. The coloring, red and yellow, is part of the whole deck-design. The cards have some sort of double border. The image is lined by black and gold and that part is set on a red background, therefore creating a second, red border. That border also holds the bright yellow half circle & box for titles in 4 languages (English, German, Spanish and Hungarian) and numbers -with XI being Strength. I would have loved seeing less border and more image, especially with these livid colors and details, but color-wise it does suit the design. The name of the deck is not so much a reference to the ethnic group of Roma or Sinti, but more to their lifestyle or – even better -the romantic notion of travellers. 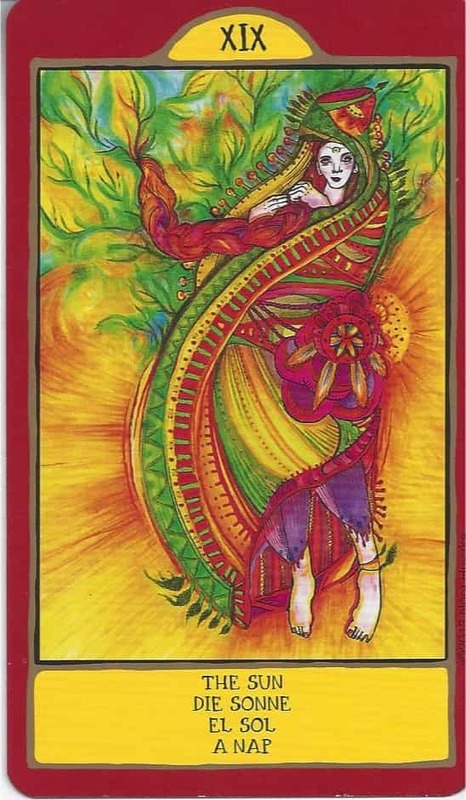 All the characters and their representation in The Gypsy Palace Tarot are bold, expressive beings. Rough beauties, thrilling outsiders and sometimes obviously weary of every day life. They have a certain Je ne sais quoi. The word palace means more a richness in experience than in wealth. 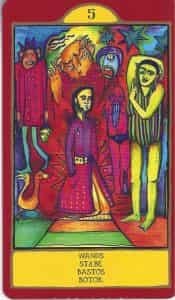 Besides that, the designer sees the people in the images ‘living’ all together in this deck, in their own colorful palace. And according to her they couldn’t care less what people think of them. Definitely a deck with an attitude. 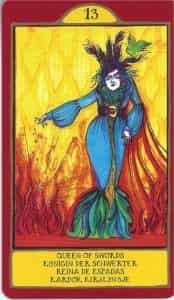 The High Priestess, The Sun, Death and The World in The Gypsy Palace Tarot. Most of the Majors fit a bit more in known imagery from systemic decks. The minor arcana is where you need to draw from other sources inside you. All-in-all it’s very vivid in both color and imagination. Adding loads of animals to the symbolism too. 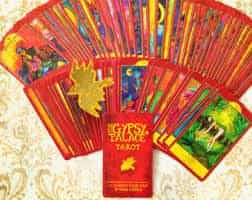 But, if you are used to an obvious system or (worse) work with a set of predetermined correspondences you will be confused if you try to use that on The Gypsy Palace Tarot. 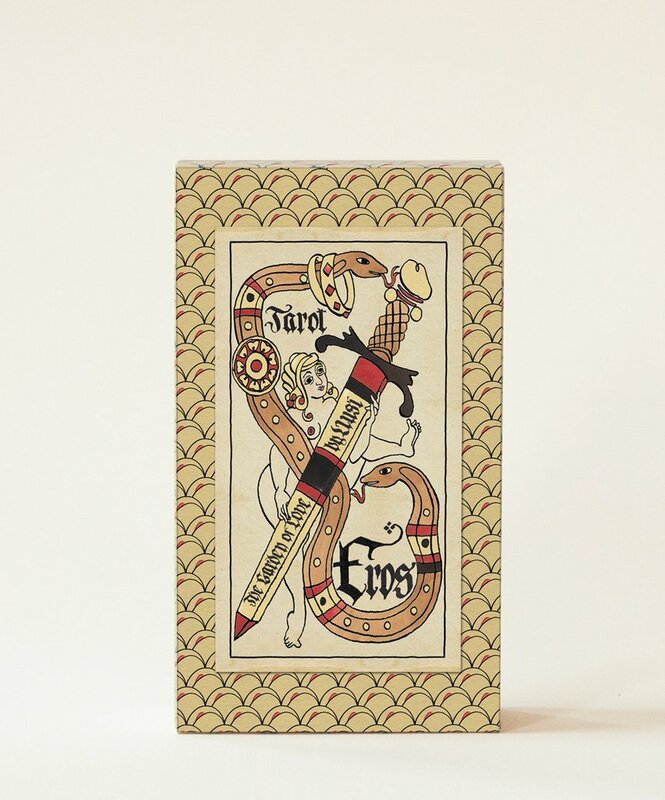 Like said before: this is a tarot deck, but also definitely art. The art came first. Most of the images were created before Huszka, and her partner in crime Matthias Furch (mostly responsible for the digitizing and finesses in coloring), decided to organise them in a deck. In that way it reminds me a bit of an oracle. And I think if you try to use that way of divination at first, it will open you up for its wisdom. While it has the 78 cards with all the obvious names you can’t rely on an amount of swords or pentacles on a card. If anything: those suit symbols are rare and I think I’ve seen them only twice. There is no *obvious* or specific symbolic system you can apply here. The meanings of the cards are reflected in the atmosphere, the positioning of characters, the coloring (albeit similar in many cards). And that definitely makes this deck not for everyone. Even when you do a basically intuitive task, your brain can be a hinder at times. So I applied that Tower card, threw everything I knew (temporarily) overboard and gave myself permission to just feel and see. After a few test readings I did a Celtic Cross and that is when it clicked. Therefore I think that Nora is right when she says that ‘palace’ refers to the characters living in The Gypsy Palace Tarot deck, because they act like a family. An extended one, or perhaps a close-knitted village. When I used a larger spread I could see what it was telling me. I am sure this could differ from reader to reader, but I think if you see many of them together you will notice the differences in mood, coloring and vision much better. Funny that such an eclectic deck fits so well in such a ‘classic’ and constricted spread. It is an intuitive deck that works wonders for free flow, so ‘the more the merrier’ or the CC was something I had not anticipated upfront. 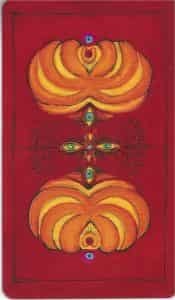 Despite being so abstract, which is normally not my first choice in decks, The Gypsy Palace Tarot slowly conquered my heart. I don’t think it will become a go-to deck, but it definitely won’t end up in the back of my closet either. Once you have it, it demands attention. When it comes to the Majors I adore The Sun and The World. I also really embraced the depiction of The Chariot, The Hermit and Judgement. I love the Queen of Swords here and the Page of Cups is super cute. Some of the minors, like 8, 9 and 10 of swords or 9 of Pentacles are still instantly recognizable when you’ve read with RWS. 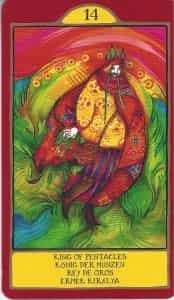 Others are fascinating – the 8’s of both Wands and Pentacles, 3 and 4 of Wands and 10 of Cups – but require other senses than that system in your noggin’. 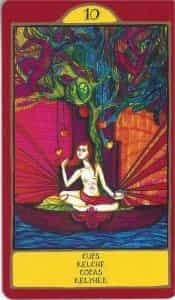 Is this deck for beginners, as in novices learning the system of tarot? No, I don’t think so. Is it a deck that will attract a mainstream public? Definitely not. 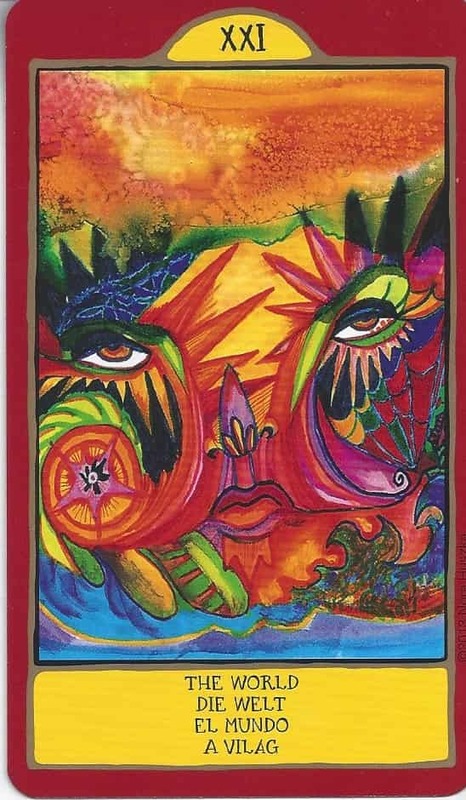 The Gypsy Palace Tarot is a work of art, but you also have to be able to appreciate its conceptuality and vibrancy. And of course the lack of any system and learning to connect. For many readers that might be a problem. However, it does have a mysterious vibe and no-nonsense ‘attitude’. Does it fall in the category brutally honest? Close, I think. It doesn’t pull any punches and it has a dramatic flair. And you can add the occasional wink to that. It sort of begs you: “Oh come on! Live a little, why don’t you?!”. So while I think it would do well in questions on life choices, you can also definitely have fun with it. Does such a quirky deck come with a companion? Yes and no. 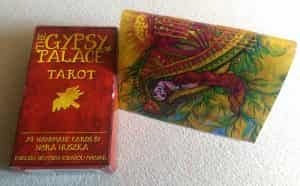 The Gypsy Palace Tarot comes in two varieties. 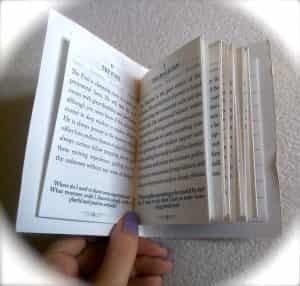 One without, but with a little leaflet that includes a spread and looks handwritten. And the other obviously *with*. That LWB is hand-made and slightly bigger than the box. 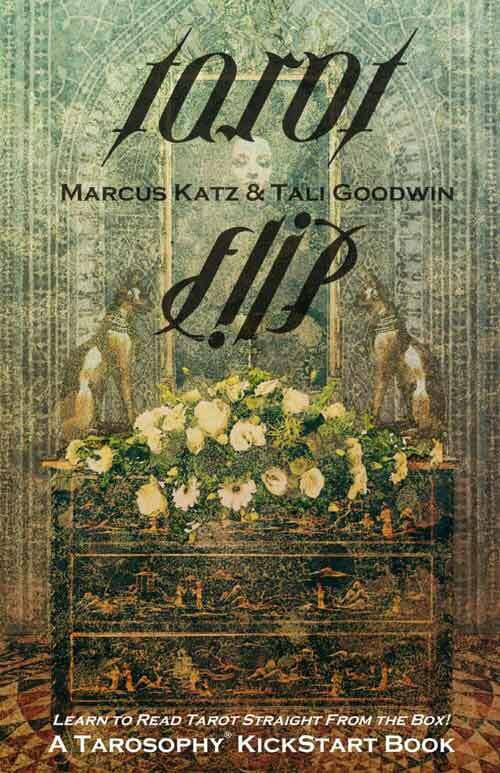 The cover is one of the Major Arcana (mine was the gorgeous XIX) with pages sown in. The little companion itself really fits the deck. Other than the hand-made vibe, it gives a paragraph of insight, a set of excellent keywords, questions you can ask yourself (loving that!) 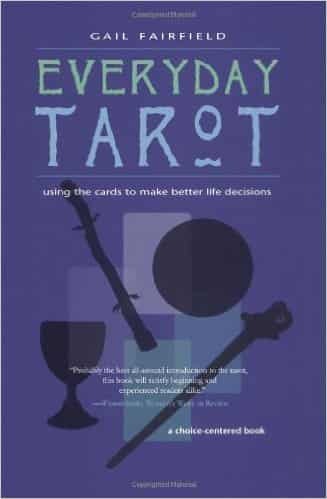 and a few pages that focus on the symbolic meaning of colors -such an important part of the deck. 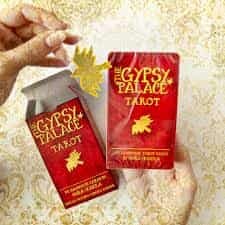 Box The Gypsy Palace Tarot and all the cards. If you’ve become enthusiastic I would really recommend buying the LWB-set. I like the little companion and it could be useful when starting out. Although if you dive right in and go your own journey instead, you’ll be fine too. 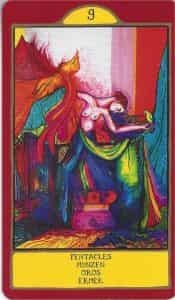 Again, The Gypsy Palace Tarot isn’t a one tarot fits all, but if you’ve been thinking of testing out your intuitive muscles and you don’t mind in your face art and lots of color, you have found your ideal tarot tutor. 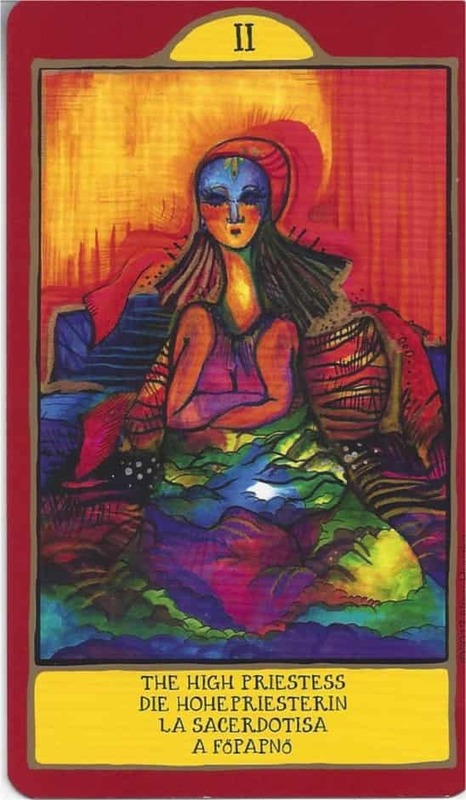 Nora Huszka is currently working on the original Starlight Dragon Tarot with tarot reader and author Steph Engert. If you missed the completely backed Indiegogo campaign, you can still pre-order via the same link.